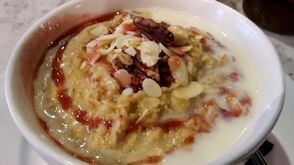 We started our journey at Leon https://leon.co/ at Euston station, where I enjoyed gluten free porridge with bananas and cinnamon. Unfortunately Ray was unable to have the dairy free version as there was no cashew milk, so instead he opted for the dairy free “Full English Pot” – baked beans, egg, sausage and bacon – after double-checking that the sausage didn’t contain milk. Even if a dish is dairy free, we always check – as you never know. For the onward train journey, we bought the dairy free Paleon Bar (also wheat free, gluten free) and the wheat free lemon, courgette and polenta cake. 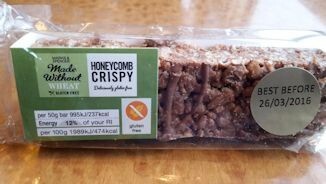 On board Virgin Trains www.virgintrains.co.uk , it is rewarding to see a variety of gluten free cakes from The Handmade Cake Company https://www.handmadecake.co.uk/ , although virtually no dairy free items except for a packet of crisps. 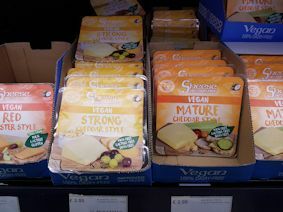 But individual soya milk portion packs are available, which is good news. That evening, we returned to one of our favourite restaurants Kasbah Café Bazaar http://www.kasbahcafebazaar.co.uk/ which serves Moroccan dishes and crucially several vegan choices. 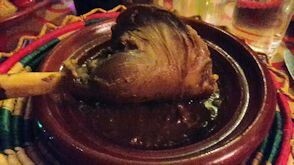 We both chose Tagine Tafraout, made from slow-cooked lamb. Bold Street is full of quirky and interesting shops and cafes. 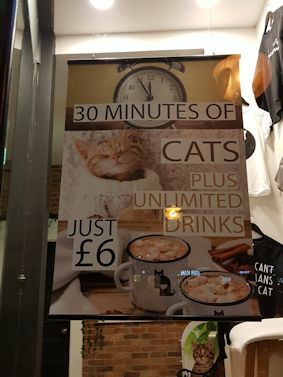 A new arrival is the Cat Café https://catcafe.co.uk/ and we saw several cats lolling around on cushions in the window – unfortunately we didn’t have time to visit, but maybe next time. 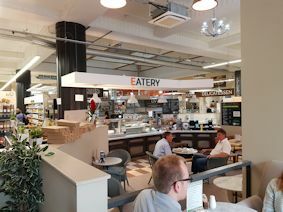 We also noticed Liv Organic & Natural Market and Eatery http://www.livfoodmarket.com/ , another new arrival in Bold Street, where you can find a wealth of ‘free from’ food to buy. 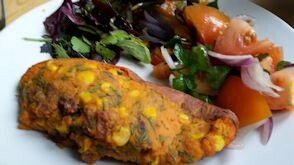 In the Eatery there’s a wide range of vegetarian, vegan and gluten free options. 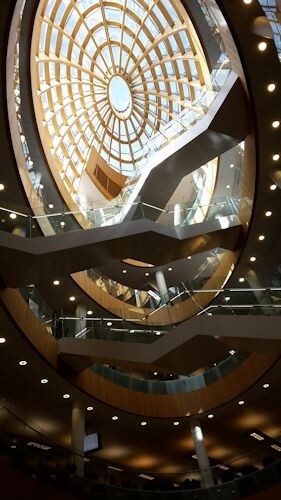 Well worth a visit next time. 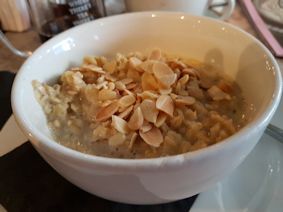 One of our favourite cafes in this street is Leaf https://thisisleaf.co.uk/ we went there for breakfast one morning and enjoyed gluten free and dairy free porridge with flaked almonds aprinkled on the top. The tea is beautifully served in a transparent 'pyrex' teapot. 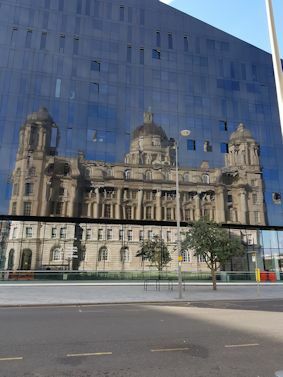 We were staying at the Crowne Plaza Hotel, https://www.ihg.com/crowneplaza/hotels but we consider their breakfast is so expensive, so every morning we would seek out a suitable cafe. In the past, we’ve found most chain cafes haven’t had gluten and dairy free breakfasts. 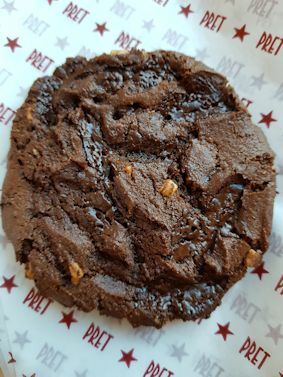 But this time we did really well at Pret https://www.pret.co.uk/en-gb The staff were cheerful, friendly and helpful on advising what we could eat. We ended up with porridge – gluten free oats and red quinoa simmered in coconut milk so it’s dairy free as well and delicious. 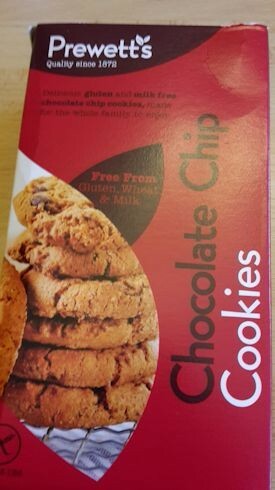 Staff pointed out the new vegan dark chocolate and almond butter cookie in the display cabinet so of course Ray had to try it and pronounced it as “rather nice”. You’ll also find gluten free lemon drizzle cake in the chiller cabinet. 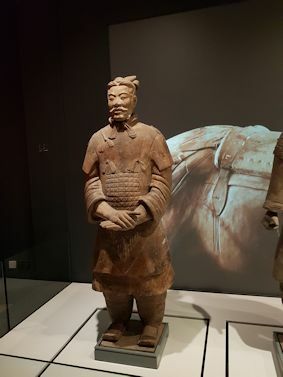 One of our main reasons for visiting Liverpool, apart from visiting friends and family, was to see the exhibition “China’s First Emperor and the Terracotta Warriors” at the World Museum http://www.liverpoolmuseums.org.uk/wml/ - the exhibition is on until 28 October. 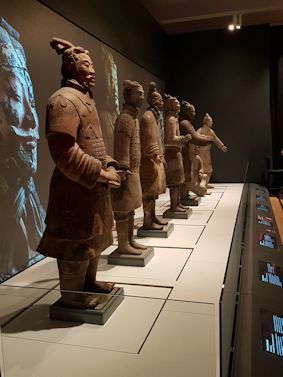 This is truly a spectacular exhibition with the terracotta warriors beautifully presented in front of back drops of scenes from China which really bring them to life. 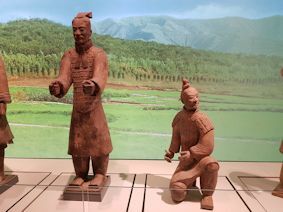 For over 2,000 years an underground army of life-size terracotta warriors guarded the tomb of China’s First Emperor, Qin Shi Huang until a chance discovery in 1974 unlocked the secrets of a vanished empire. The exhibition isn’t just about the warriors as it includes objects spanning 1,000 years of Chinese history. 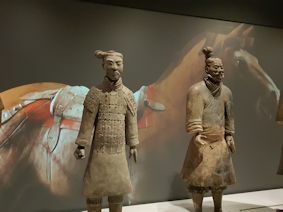 The exhibition illustrates the Emperor’s quest for immortality and how he prepared for the after life 2,000 years ago. At the museum café, we had tea with soya milk – gluten free brownies and muffins were available, but Ray was hard pressed to find anything dairy free he could eat. 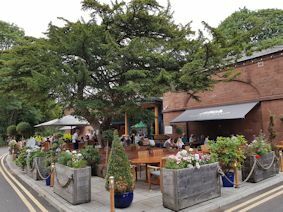 For lunch our friends took us to the Old Stables restaurant at Allerton Manor Golf Club https://allertonmanorgolfclub.com/ complete with an outdoor patio area. The golf club is set in beautiful woodlands and it’s easy to see why the club’s Hay Loft is a popular wedding venue as it forms the perfect setting for photographs. As we arrived, a bride and groom drew up in a vintage car. At the Old Stables restaurant, the menu had symbols VG for Vegan and GF for gluten free. 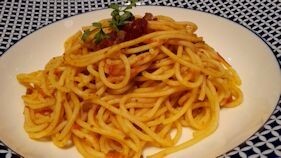 It said for any other intolerances or allergies, diners were advised to ask the staff. 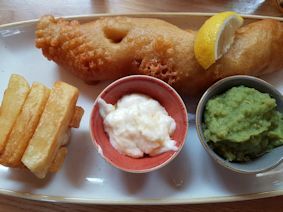 Ray opted for the fish and chips – Penny Lane beer batter, hand-cut chips and mushy peas without the tartare sauce – after checking there was no milk in the batter. 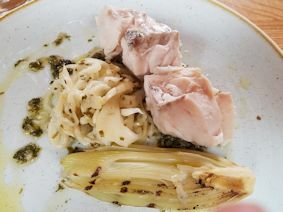 I enjoyed Poached Hake with roasted fennel – delicious. We were too full for dessert, although there were a couple of gluten free choices on offer – Eton Mess and Pannacotta. There was nothing Ray could have except a range of sorbets. The restaurant is renowned for its afternoon tea – a gluten free version is available and they can prepare a dairy free tea provided you let them know in advance. Maybe next time? At London’s Euston station we bought some food for the train journey to Liverpool from Pret A Manger http://www.pret.co.uk – a chef’s special salad with chicken, parmesan cheese and pecan nuts for me, while Ray enjoyed a pole line caught tuna baguette with mayonnaise, (with no butter) and slices of cucumber, although he had to pick out the cucumber as he can’t eat it. Whenever we go travelling, Ray and I always take soya milk with us in small 100ml bottles from Muji www.muji.eu – so we were amazed to find it on board the train to Liverpool on Virgin Trains www.virgintrains.co.uk in the shop one portion cartons of soya milk. Amazing – a real breakthrough. We were staying in one of our favourite hotels Hope Street Hotel www.hopestreethotel.co.uk but our special deal didn’t include breakfast. So we returned to Leaf in Bold Street www.thisisleaf.co.uk We noticed that their menu has helpful symbols – (N) contains nuts, (V) vegetarian, (VV) vegan, (G) gluten. It now has a gluten free menu. 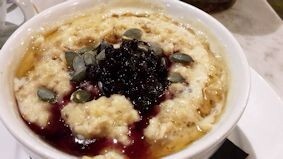 On one occasion Ray had Maple Syrup Porridge with blueberry compote and toasted pumpkin seeds. He requested for it to be made with soya milk rather than ordinary milk. On another day he had toast (with no butter), bacon and baked beans. Gluten free choices included Gluten Free Vegan Breakfast – falafel sausages, roast vine tomatoes, gluten free toast and pureed avocado. Yum! On one evening we dined at the Moroccan-style Kasbah Café Bazaar in Bold Street http://www.kasbahcafebazaar.co.uk/ where most of the staff wear red fez hats. The décor is reminiscent of Marrakesh. We noticed there was no longer a retail section, but staff told us you could buy any of the merchandise displayed such as lamps, rugs and indeed fez hats! There were symbols on the menu indicating vegetarian, gluten free, vegan as well as a small “Vegetarian and Vegan” section on the menu offering dishes such as Tagine Lala Meulah – a butternut squash tagine. 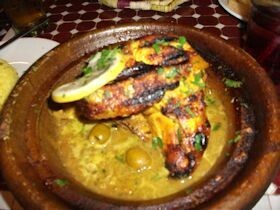 We both ordered the lamb tagine, having been reassured by our waiter that it didn’t contain gluten or dairy. Very tasty. 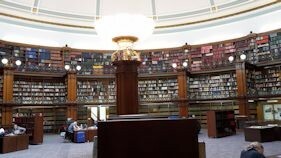 Our friends took us to see Central Library in William Brown Street https://liverpool.gov.uk/libraries/find-a-library/central-library/ , a very impressive building especially the Picton Reading Room, one of the most extensive libraries in the world. 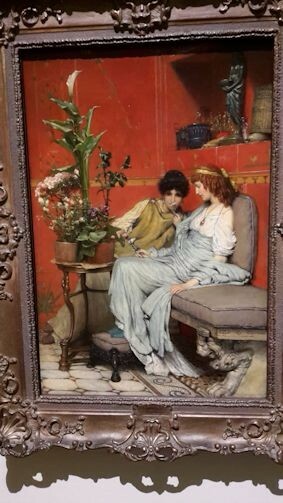 We then visited The Walker Gallery http://www.liverpoolmuseums.org.uk/walker/ where we attended the “Victorian Treasures” exhibition. At Carluccio’s, we asked for the gluten free and dairy free menu. This is a great improvement as they only used to have a gluten free menu. 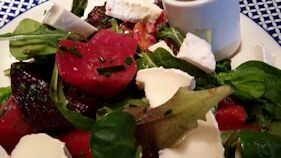 I chose Beetroot and Goat’s Cheese Salad, while Ray enjoyed Spaghetti Beef Ragu (from the dairy free menu). 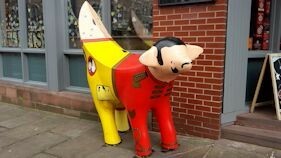 I was pleased to see that Liverpool’s colourful Super Lambananas (a cross between a lamb and a banana!) 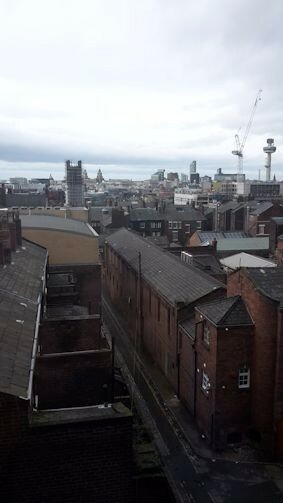 were much in evidence around Liverpool. 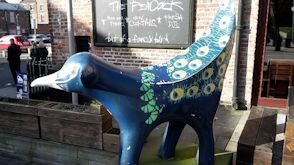 Designed by Taro Chiezo, The Super Lambanana was originally created for the 1998 ArtTransPennine Exhibition. 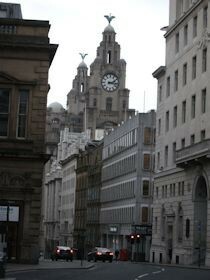 It reflects the history of Liverpool, as both sheep and bananas were common cargos in the city's docks. 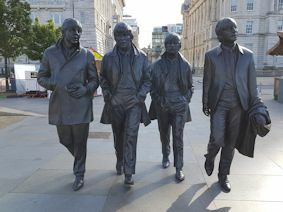 In 2008, when Liverpool was designated European Capital of Culture, 125 replicas were created, each with a different design. There aren’t that many now but if you’re lucky you’ll find some as you walk round the city. The next day we popped in to see Marmalade Skies for morning coffee in Allerton Road http://www.marmaladeskiestearooms.co.uk/ , number 5 in the Liverpool Echo’s top best afternoon teas for kids. 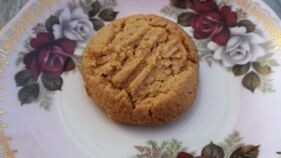 We tasted delicious gluten free and dairy free peanut butter cookies, as well as cherry scones. 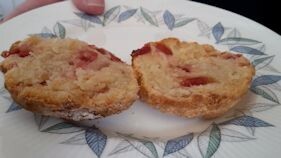 Both were deliciously moist, which is difficult to achieve in gluten free baking. This was accompanied by tea and soya milk. The café is well equipped for kids with a pram park at the back, a kids’ reading area, a playroom with toys. 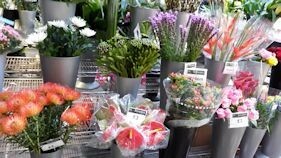 The lunch menu has a “pick and mix” section for kids comprising a list of items such as carrot sticks, grapes, strawberries, melon, breadsticks, pasta spirals and natural yogurt, from which kids can choose three, four or five items at different prices. These are all served in a silicon cup case. On Saturday night we met friends at Chung Ku Chinese restaurant www.chungku.co on the waterfront, where we could see the lights of Birkenhead and an illuminated oil tanker passed by. As we were a big group, we chose the banquet menu at £22 per person. It was completely dairy free, but there were some items that contained gluten so I was brought a gluten free menu where I chose chicken delight with iceberg lettuce and plum sauce instead of hoi sin sauce. When the others wrapped their aromatic crispy duck in pancakes, I smeared the iceberg lettuce with plum sauce, put some duck on it and rolled it up. Very tasty. I couldn’t eat the breaded chicken or the sweet and sour pork, but there were plenty of alternatives to choose from such as sliced beef in satay sauce or chicken with cashew nuts. The chicken and sweetcorn soup was delicious. Our last meal in Liverpool was at Thai restaurant ChaBa ChaBa in Allerton Road www.chabachaba.co.uk We do like Thai restaurants as they generally don’t use dairy but we always check. You can never be complacent or assume a dish won’t contain certain ingredients. 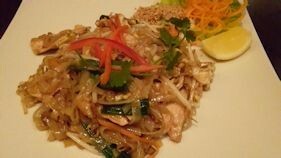 We ordered Phad Thai and was told the dish contained rice noodles, with no gluten or dairy. I had the chicken version, while Ray had the duck. For the train journey home, we visited the Marks & Spencer www.marksandspencer.com shop at Liverpool station. I bought a roast chicken and avocado sandwich “made without wheat or gluten” while Ray finally found a chicken and sweetcorn sandwich with mayonnaise, but no butter or milk. 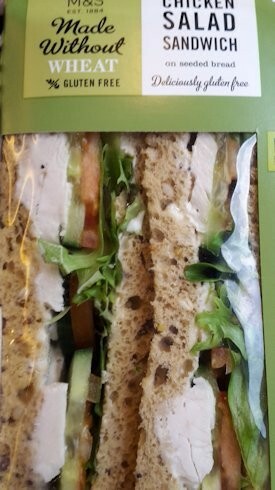 We’d heard about the M&S vegan sandwich but couldn’t find it and a member of staff couldn’t track it on the computer. One to watch out for. As we had a long journey ahead, Ray and I visited the Marks & Spencer www.marksandspencer.com shop at London’s Euston station for some provisions. We were pleased to see Leon www.leonrestaurants.co.uk now has a branch there, but we were short of time so decided to try M&S. A gluten free buddy had told me that M&S had introduced gluten free sandwiches so I wanted to check if this was the case. For Ray, who is dairy free, it would be problematic as he has found that M&S sandwiches usually contain milk. 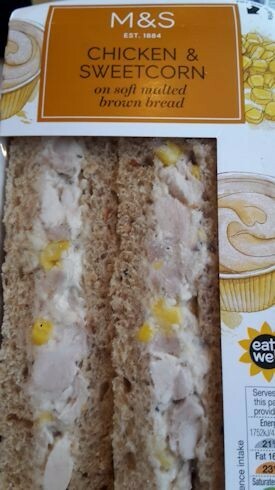 I was delighted to find a chicken and salad sandwich “made without wheat or gluten” and after reading all the labels, Ray finally found a chicken and sweetcorn sandwich with mayonnaise, but no butter or milk. 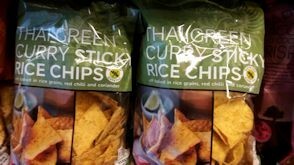 There was also a wheat free, dairy free Honeycomb Crispy Bar and Thai Green Curry Sticky Rice Chips (150g bags) which were more like crisps– rice and maize chips with red chilli and coriander. M&S seem to be making an effort to cater for people who are gluten free but it remains to be seen whether they will do the same for people with other allergies. 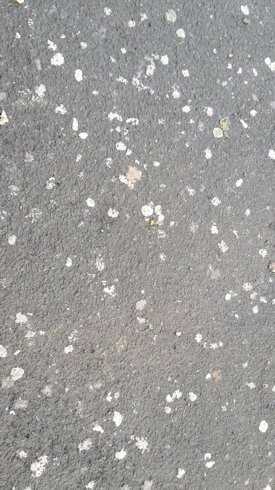 One of the strange sights we encountered in Liverpool everywhere were these peculiar confetti-like white dots on pavements. Ray and I thought it might be seagull droppings, but when we asked the tourist office we were told it was chewing gum! We met our friends at the Bear & Staff pub, 24-26 Gateacre Brow, Liverpool L25 3PB http://www.chefandbrewer.com/ where I enjoyed gammon steak and potato fries, while Ray ordered steak, chips and mushy peas (it’s his northern roots). We were staying in one of our favourite hotels Hope Street Hotel www.hopestreethotel.co.uk but our special deal didn’t include breakfast. So we returned to Leaf in Bold Street, www.thisisleaf.co.uk one of our favourite venues. We noticed that their menu now has helpful symbols – (N) contains nuts, (V) vegetarian, (VV) vegan, (G) gluten and (GA) gluten free alternative. We found the staff at Leaf very understanding and accommodating, although it was a surprise they didn’t serve gluten free bread. On one occasion, Ray had porridge made with soya milk and on another day, the vegan breakfast comprising two falafel sausages, field mushrooms, baked beans (he was assured they were Heinz as other varieties can contain cow’s milk), potato croquets and toast. Mostly I had a cooked breakfast accompanied by Nairns www.nairns-oatcakes.co.uk oatcakes which I brought myself. We visited the Foundation for Art and Creative Technology (FACT), Wood Street, Liverpool L1 4DQ www.fact.co.uk to look at its current exhibitions, although the centre also offers a film programme. 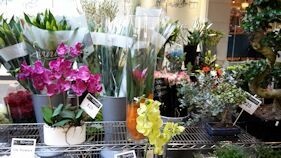 We stopped off at The Garden @ FACT , which is run by the team at Leaf. The menu has symbols for (V) vegetarian, (GF) gluten free (VV) vegan and (N) nuts. I opted for a baked sweet potato with a mixed bean and sweetcorn topping and a salad, while Ray chose a tuna sandwich in granary bread, requesting no butter as he had an allergy to dairy. The staff member queried the mayonnaise in the sandwich, but Ray pointed out that this was ok as it was made from egg whites and oil. Ray did feel poorly although there wasn’t an instant reaction. The next day we visited our friends who shared with us “free from” products we hadn’t seen such as the delicious Prewett’s www.prewettsbiscuits.com gluten free and milk free chocolate chip cookies and Schar’s www.schar.co.uk gluten, wheat and lactose free Grissini (bread sticks). 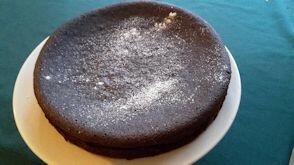 They had made a wonderful gluten free and dairy free flourless chocolate cake using Nigella Lawson’s recipe www.nigella.com - we felt very spoiled. We visited Liverpool at the time of Chinese New Year so joined in the colourful celebrations, led by the dragon dance. In the evening, we visited Arabesque Bazaar & Bistro Moroccan restaurant, 56-58 Lark Lane, Liverpool L17 8UU, which also sells Moroccan rugs, lamps and ceramics. 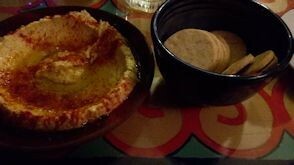 Here I enjoyed hummus with gluten free crackers followed by Lamb Tagine with rice. Lark Lane should be renamed Restaurant Row as it is predominantly restaurants so you can wander up and down the street until you find a restaurant you fancy. well known for Sunday roasts. I didn’t feel that hungry so ordered a feta cheese salad. 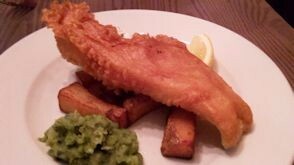 To Ray’s delight, he discovered that the batter used for the fish didn’t contain milk so he relished his meal of fish and chips, something he has rarely because the batter usually contains milk. This is what we did on arrival at London Euston railway station. I bought a Chef’s Italian Salad, a delicious combination of chicken, salad and pecan nuts, while Ray opted for a dairy free sandwich with Wiltshire ham. 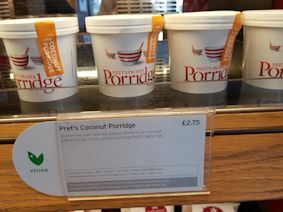 What’s great about Pret is that their food is clearly labelled on the shelves so you can see at a glance what’s in it. Ray made a new discovery – dairy free Handmade Apple Cake (£1.60). He found it rather sweet, but also moist and was so pleased to find a cake he was able to eat. I had to content myself with mango and lime fruit instead of a cake! Pret has also started Miso Soup which Ray can eat, but I can’t as it has gluten in it. One of our favourite places in Liverpool is Leaf in Bold Street www.thisisleaf.co.uk it has an eclectic bohemian feel about it – a mix of Laura Ashley lampshades, wooden floors, glitter balls and benches. Tea is served in a cafetiere and soya milk is available. When we visited they’d sold out of gluten and dairy free cakes so I had hummus and salad, while Ray had toast with honey. 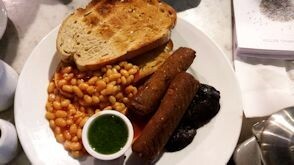 We recommend Leaf for their cooked breakfast and porridge which can be made with water and served with soya milk. We returned on another occasion for lunch. 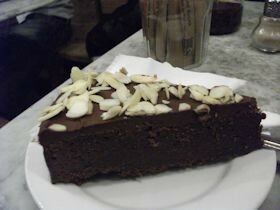 My choice was red pepper and tomato gluten free soup, followed by gluten free chocolate and almond cake. The cake was a real treat and melted in the mouth. Ray ordered the ground beef burger before checking there was no dairy in it, but when it arrived there was melted cheese on the burger. He took the meal to the counter and pointed out the error, where they apologised. Another waitress came to the table to apologise and a ‘naked’ burger arrived, which Ray said was worth waiting for. To our surprise, the manager came to see us to apologise and give us a refund. This is the first time in our experience that any restaurant has refunded the cost of a meal because of a food allergy. On our first evening, we returned to Kasbah Café and Bazar in Bold Street www.kasbahcafebazaar.co.uk , which serves Moroccan cuisine. 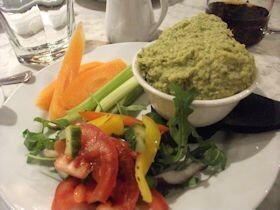 To start with we had olives (£1.95) and hummus (£3.95) – I was given slices of cucumber and carrots instead of bread. 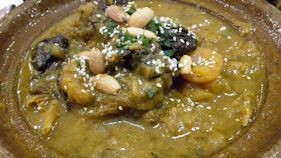 For the main course, I ordered Tagine de Marrakesh, dairy free and gluten free, comprising chicken breast with saffron and preserved lemon confit (£8.95) while Ray chose Tagine de Fez – lamb tagine with caramelised onions, prunes, roasted almonds, apricots and sesame seeds (£9.95). No alcohol is served at this restaurant, so I enjoyed cranberry juice and Ray drank apple juice (£1.70). Service is friendly and fast and they weren’t fazed by our dietary concerns. The restaurant also sells Moroccan goods including spices or fezs! At our hotel the Crown Plaza http://www.ihg.com/crowneplaza/hotels/gb/en/liverpool/lpluk/hoteldetail , there was a special deal on breakfast at £10 a head (usually £14.50) at weekends, so we decided to give it a try. There was an extensive buffet so you could see exactly what is on offer. Soya milk was freely available so Ray could have some cereal. I asked for toasted gluten free bread which was delicious – probably Genius www.geniusglutenfree.com I opted for a cooked breakfast of egg, bacon, potatoes and mushrooms, avoiding the sausages. Ray chose to have fried bread and bacon, although he could have beans as well. To follow I enjoyed a plate of fruit from the extensive array. If you have a food allergy, you’re always advised to ring up the restaurant ahead and warn them. In some establishments this really pays off, while in others it makes no difference at all. This was the situation when we arrived with a group of friends at Bistro Jacques www.bistrojacques.com . Ray said we had phoned in advance, but the waiter looked surprised and taken aback when Ray explained his allergies. Panic ran across his face; Ray said “I’d like steak and chips – no butter or sauce on the steak.” “I’ll check with the kitchen, sir,” so off he went to the kitchen to the consternation of our friends who hadn’t ordered. “We’ve lost him,” Alan said. Fortunately he did return and confirm that Ray’s order was ok and how did Ray like his steak cooked. There was a reasonable pre-theatre menu but we couldn’t see anything we were able to eat because all the dishes were covered with a sauce, normally not suitable for us as they tend to have wheat flour, milk or cream in the sauce. I opted for seabass without any sauce and chips. We were given a dish of vegetables without butter on them. If you suffer from a food allergy, dining out with friends can be difficult because you don’t want to make a fuss or appear awkward. On the other hand you don’t want to get ill either. Buying lunch for the journey back to London on the train was problematic. Pret A Manger in Liverpool at 10.30am had no salads and all the sandwiches had butter in them so no joy there. We tried Sainsbury’s – nothing doing there either. At Marks & Spencer www.marksandspencer.com Ray searched high and low for a sandwich but found they all had cow’s milk in them. How can chicken and mayonnaise or a ham and mustard sandwich have dairy in it unless it’s in the bread? Eventually he found Hoisin Duck wrap with cucumber, hoisin sauce and spring onions, but had to carefully pick out the cucumber and spinach as he can’t eat them. 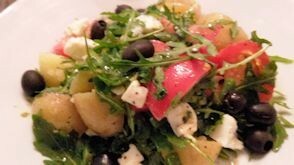 When I examined the salads at Marks & Spencer, it was surprising how many had wheat, gluten or cow’s milk in them, but eventually I found tuna and three bean salad which didn’t. Historically we’ve found Marks & Spencer impossible to find free from foods although other people have informed us they do sell them. I think they need to offer a greater choice.